I live just steps from the St. Lawrence River. I love going for long walks along the water. Often, I make interesting discoveries. This week, I collected rocks that lined the water's edge. As I held the rocks, I wondered how I could use them, what I could create with them. That's how I came up with this memory game that takes less than 5 minutes to prepare. As you will see, it could not be simpler. Clean the rocks if necessary. Set them aside until they are dry. Once the rocks are dry, paint a basic shape or design on each one. 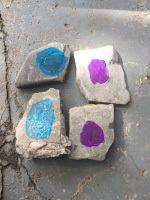 Each shape or design must be painted on two different rocks to create your memory game. Let the paint dry. To play, arrange the rocks upside down in front of your group. Children take turns turning two rocks over. The goal is to find matching shapes or designs. If a child succeeds, he sets both rocks in front of him. If they are different, he must turn them over and another child may attempt to find a match. Store the rocks in a plastic bin so you can play as often as you wish.